Disposable specimen trays with sticky immobilizing tape: Lunar PIXImus Corporation Headquarters, 726 Heartland Trail, Madison, WI 53717. Figure 1 A: Lunar PIXImus2 densitometer with integrated PC computer. 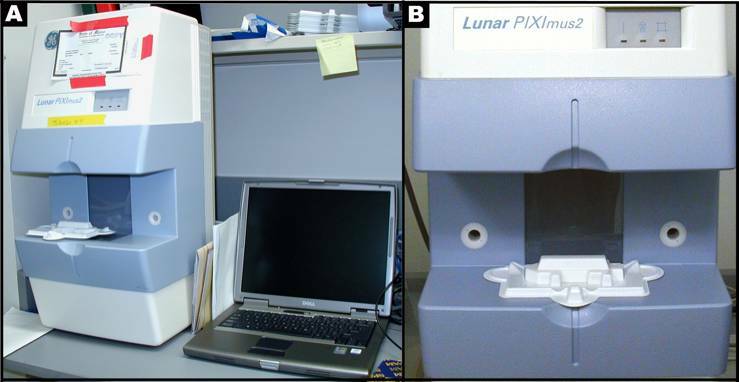 Figure1 B: Close-up detail of the Lunar PIXImus2 densitometer with specimen tray. Investigator's notes: 20-mo old mice destined for necropsy (Sundberg1) are euthanized using CO2 gas asphyxiation before they are scanned. PIXImus (small animal DXA system, PIXImus™, Fitchburg, WI) scanning of mice for BMC and % fat is both accurate and precise although body size must be considered when comparing inbred strains. Full body scans are obtained and X-ray absorptiometry data gathered and processed with manufacturer supplied software (version 1.43.036.008). a. Before the system is used the PIXImus is calibrated daily with a "phantom mouse" according to manufacturer's protocol. b. To obtain the PIXImus scans, 6, 12 and 20-mo old mice are weighed and body weight recorded, and then the mice are anesthetized under approved protocols with Avertin (Tribromoethanol; 0.2 mL/g body weight, injected i.p.). c. Anesthetized mice are positioned dorso-ventral with the tail positioned away or alongside from the body, the front legs extended to the side, and the neck and spine are gently straightened. d. Then each mouse is placed on the specimen sticky tray (body must be within blue line on the tray) under the PIXImus beam path (see Figure 1B above). Care is taken to ensure that the limbs are extended (i.e. limb bones are not over lapping with each other or with the rib cage) and that with the exception of the head, all of the mouse, including the tail can be viewed in the resulting image. e. Trays are positioned such that the area of the head is always oriented toward the left from the investigator's point of view, and the mice are positioned dorso-ventral in order to scan the entire body and tail. The X-ray process to obtain a single full scan is approximately 4 min. f. Disposable plastic trays, with sticky tape for immobilizing mice, can be saved and re-used after cleaning and disinfecting. Based on PIXImus validation studies (Nagy, 2000; Johnston, 2005) DXA estimated measurements of fat tissue correlate well with measurements obtained from chemical extraction. This is made possible by developing software versions with equations that adequately correct raw DXA measurements. b. 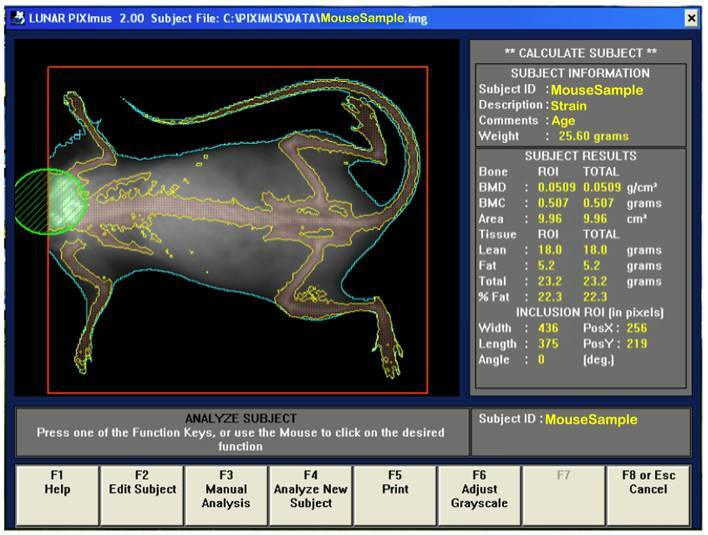 Following the completion of a scan, the mouse sample is then outlined in blue and the bones in yellow (see image below). Investigator's note: Any mouse for which all 4 limbs cannot be seen independently or for which part of the mouse is outside of the detector viewing area was either rescanned or the data for that mouse was removed from the data set. Only whole body data is collected for this data set; no sub-regions of interest. c. The area to be analyzed is defined by a red box, and area to be excluded from the calculations is defined by a green circle (i.e. excluding the head). The arrow keys are used to adjust to the desired size, in addition to holding the control key down to enlarge or elongate the circle or square areas. d. Once the head has been excluded, the Enter key is clicked and resulting data measurement is displayed. By pressing F5 a hard copy of the image and the scan analysis result is printed. e. To prompt the computer to finish the session, F8 or Esc key is clicked once, and then clicked again to return to the main menu screen where the next subject to be tested begin. f. Acquired data is saved on the hard drive and CD disk for later archiving. PIXImus data are from the whole body exclusive of the head. Areal bone mineral density (aBMD), bone mineral content (BMC), bone area, total tissue mass, total tissue area, lean tissue mass, percent body fat, body weight, and body length were measured. Bone area measurement is generated by outlining or specifying the limits or dimensions of the entire skeletal bone regions of the body (limbs, neck, spine, and tail), excluding the head, following a full body X-ray scan. Bone mineral content (BMC) is generated from PIXImus density scans which are assessed for accuracy using a set of 0.0 mg to 2,000 mg of hydroxyapatite standards. According to the DXA system, bone mineral content (measured as the attenuation of the X-ray by the bones being scanned) is divided by the area (also measured by the machine) of the site being scanned to obtain bone mineral density (BMD).